In this video provided by Garden Answer, we will learn how to plant succulents on driftwood without the use of soil. 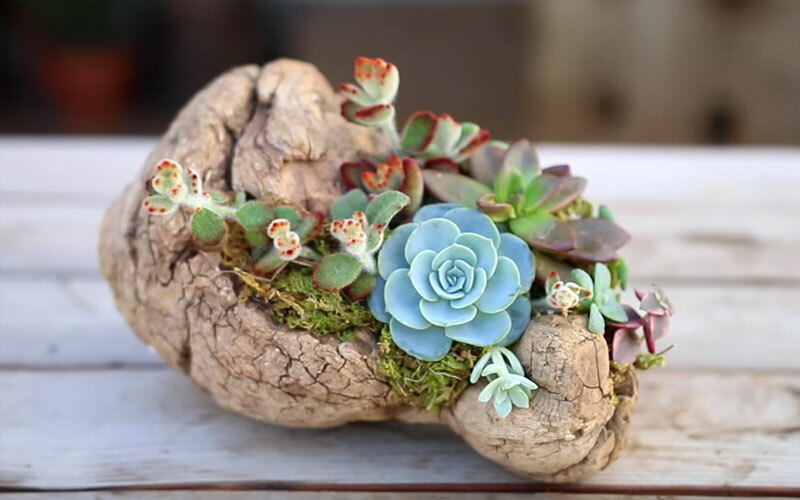 Simply gather your piece of driftwood, some sphagnum moss, a hot glue gun, a pair of scissors, and an assortment of succulent clippings to be on your way to creating a beautiful succulent arrangement. It is a very simple and fun process that you can even have the kids help with. Once put together, the succulents really only need about four to six hours of sunlight and a once a week watering to stay happy and healthy. Now, keep in mind the succulents will start to want to root in a few weeks to a few months as they outgrow the driftwood, so this is not a long term project. When this occurs, you will need to gently remove them and plant them in soil as they continue to flourish. There is also a very slight chance that some will not root or survive, which is the risk taken when using cuttings. But again, this is slim and should not deter you from trying this out. This is a great little project to attempt, so be creative and have fun with it! Good luck.